informazione, intelligence, politica internazionale e sicurezza – COOKIE: avvisiamo i visitatori che il presente sito web utilizza solo dei cookies tecnici e non di profilazione. Se accedete ai link esterni, i siti web di riferimento comunicheremo di conseguenza l’avviso relativo, esonerandoci da qualsiasi adempimento. biblia su Servizi Segreti: perchè la fede cristiana, ancora oggi,viene ritenuta una minaccia? Barry Shaw: Assad, Putin, and the smart move that Obama must make. From warfare to lawfare. Best evidence that these words have real meaning can be seen in the “words not action” policy of the Obama Administration when it comes to Syria. Chemical weapons were moved around and utilized by the Assad regime and Obama did nothing. I predict that Assad will still be in power after Obama vacates the White House. With the injection of Russia into Syria, it seems that it is Obama’s days that are numbered, not Assad. It’s open season for contempt for America. So here’s another prediction for you. I predict that Russia will be in Iraq before Obama leaves the White House. The signs are already there that ISIS will be the excuse for Russia to “assist” the Iranians fight Islamic State in Iraq. Are these “weak” words US strategy, or policy? Does America have a policy or strategy? It certainly doesn’t look like it from here in the Middle East. By simply saying that ISIS and Assad must fall is effectual. Words don’t cut it and, in the tough worlds of real politics, foreign policy and global strategy, Obama projects utter weakness and incompetence. In an election debate on October 22, 2012 with Mitt Romney who had called out Russia as being America’s worst threat going forward, Obama scoffed Romney by saying, “You said the biggest national security threat against America is Russia, not Al-Qaida, but Russia.” Three years later it is legitimate to ask, who was right? Obama always backs losers, dangerous losers. Examples are the rebels in Libya who were against Gadhafi, The Muslim Brother hood in Egypt, Iraqi forces instead of the brave fighting Kurds, Syrian rebels. He is even schmoozing Iran. According to Middle East strategic experts, Obama is a proven chronic loser. Using this excuse, Putin and Assad can claim that any other aircraft flying in sovereign Syrian air space will be considered enemy and liable to be shot down. There is an expression which is applied to the killing and destruction of terrorist enclaves. It’s called “draining the swamp.” America was not too keen to drain the Syrian swamp so Putin has taken it upon himself to be the exterminator. The Obama Administration, alarmed that Russia said they would target ISIS and instead bombed their allies cannot shout too loudly about it because there is more than a whiff of hypocrisy about it. America turned away as Turkey promised the Administration that it would target ISIS but has been heavily bombing the fighting Kurds in Iraq with American knowledge and silence. There is more than a suspicion that Turkey bought American silence by allowing the US to use Turkish air bases to fly sorties against ISIS. What options are open to the Obama Administration? As the clock ticks down to his departure, Obama is leaving the next US president an impossible legacy. There remains only one avenue open to Obama if he wants to save face and out-maneuver Putin in Syria without enlisting military force. If you don’t want to use warfare, use lawfare. If America does not want to get into a military fight against Assad, it should think out of the box and apply “lawfare” against the criminal head of Syria by bringing war crimes charges against him to the International Criminal Court in The Hague. It is undeniable that Assad has committed both humanitarian and war crimes. The evidence is at hand. There is no dispute that charges can be brought against Assad to the ICC at The Hague, and there are thousands of witnesses and compelling evidence to prove the case. Assad is the central pawn in Syria upon which Russia stands or falls in its ambitions there. The only way that a US Administration that is loath to use military force to dislodge Assad from power is to bring him to justice for crimes against his own people. With approaching 300,000 Syrians murdered by Assad, the international crimes are self-evident and a conviction can be brought quite convincingly. If the Obama Administration claims it wants to bring down Assad for the sake of the people of Syria he is killing, this is the way to do it and, at the same time, trump Russia’s latest moves in that country. Since the US isn’t party to the ICC statute it can’t institute prosecutions against anyone. However the ICC statute does enable the UN Security Council to institute proceedings. Therefore, the US can table a motion in the UN Security Council to institute proceedings against Assad. This would place Putin in the indefensible position of protecting a designated international war criminal. Should he continue to support Assad, further heavy sanctions could be brought against Russia by the United Nations. This is the only move that Obama can play to put Putin in a corner that it will be difficult to get out of and, at the same time, get rid of Assad for the benefit of the Syrian people. 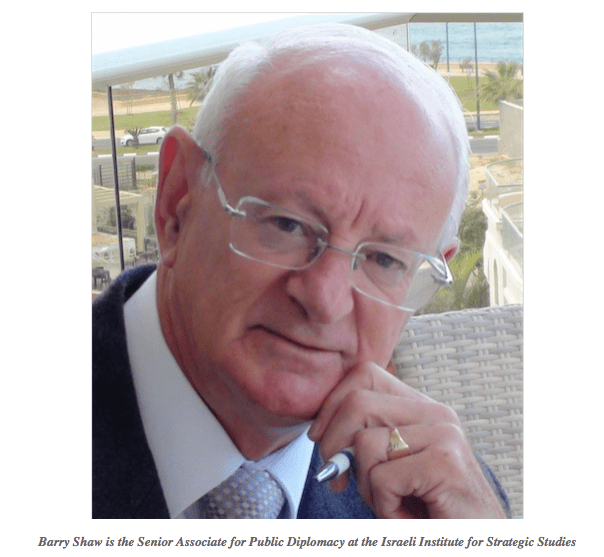 Barry Shaw is the Senior Associate for Public Diplomacy at the Israeli Institute for Strategic Studies. Questo contenuto è stato inserito il Ottobre 4, 2015 ore 7:09 am nelle categorie English, Flash News, Scenari internazionali, Servizi Italiani, SICUREZZA PARTECIPATA. puoi seguire i commenti tramite RSS 2.0 feed. non è possibile inserire commenti per questo contenuto. La Costituzione della Repubblica Italiana: Art. 1. Ma chi è Matteo Messina Denaro? “Trattativa mafia-Stato”: perchè quel dossier su “mafia-appalti” è stato archiviato? ICSVE By Anne Speckhard, Ph.D.
Dr. R. Evan Ellis, new article on PRC activities in Brazil. The Dominican Republic; Security challenges, government responses and recommendations for the U.S.
L’attentato di Londra: la politica del Tycoon è lungimirante. Cosa sta succedendo agli americani o cosa potrebbe accadere negli USA ? Servizi Segreti: il generale Wesley Clark, già capo della Nato! ” RIVOLTA ED ANARCHIA DEI POPOLI EUROPEI” ? Giovanni Lippa: Regeni, tante chiacchiere, poca dignità. Stefano Maullu – Europa e Russia: quali rapporti? Secret Service: who will be the next upcoming President of the United States ?? In memoria di un servitore dello Stato e di tanti altri italiani che lavorano nell’ombra rischiando quotidianamente la vita! How is NATO assisting in the refugee and migration crisis? Intelligence ECOFIN: Pessimismo Informato contro Ottimista da notizia. Pandora’s box : we put out the hope! Politica internazionale: il Patto Atlantico. CRIMINALITA’ ORGANIZZATA AUTOCTONA E JIHADISTA: Una nuova minaccia? Tel Aviv: CyberTech 2016 !! Dr. R. Evan Ellis: Venezuela: Into the Abyss? Spionaggio: Rudolf Ivanovich ABEL, il “Residente Illegale”. Intelligence ECOFIN: gli Istituti di Credito dell’Islam. Ambassador ret. Yoram Ettinger: US-Israel relations: downturn or upturn? Terrorismo Internazionale (ISIS): le nuove forme di proselitismo ed arruolamento via web. Spionaggio Informatico. Perchè non parlarne? Why not talk about it? Safety: Don’t travel to any Islamic Nation! Da GROUND ZERO al GIUBILEO: l’evoluzione dell’homeland security in risposta alla minaccia terroristica. While an Iranian Official Says We ‘Reject the Existence of Any Israeli on this Earth’ the UN shamefully keeps silent! Albert Chestone: what America means to me. Sen. G.Esposito: “La sicurezza dell’Europa si ottiene anche grazie all’unità della Grecia”. Lookout News:un nuovo approccio per l’analisi del terrorismo e dell’antiterrorismo. Servizi Segreti: UNA INTELLIGENCE EUROPEA? CYBERPOL stress the need for a coordinated cyber crime management program at 3rd World BORDERPOL Congress Budapest. Baretzky President of the ECIPS speaks on cyber theft and espionage cost. Anno accademico della scuola di perfezionamento per le forze di polizia. What is the CyberEurope2014 and why is it so important? Allarme hackers alla Casa Bianca Il dubbio: spie pilotate da Mosca? Magdi Cristiano Allam come Oriana Fallaci? Assistiamo in maniera passiva ad una nuova crociata. Servizi Segreti: minaccia jihadista di proselitismo giovanile in europa…. Contro l’ America, provocazioni e istigazioni gratuite!! Servizi Segreti: Erdogan, sarà l’interlocutore privilegiato tra Europa e Medio Oriente? Il virus Ebola può essere fermato! Servizi Segreti<:"Le immagini satellitari mostrano che l'Ucraina è colpita dalle truppe filo-russe attraverso il confine"
Servizi Segreti:”Gli hacker rubano informazioni di contatto dell’utente e altri dati da un database del sito web della Banca centrale europea, in un tentativo di estorsione”. Italia & Europa: semestre europeo! Servizi Segreti: “Le best practice in materia di cyber-security per le PMI”. Copyright © 2019 SERVIZI SEGRETI. All Rights Reserved. Creato da Servizi Segreti .com. Servizi Segreti.com è un portale libero ed indipendente, senza alcuno scopo di lucro. Autogestito dai redattori. Ogni articolo non rappresenta una precisa linea editoriale ma esclusivamente il pensiero dell'autore che lo firma. Servizi Segreti .com by servizisegreti.com is licensed under a Creative Commons Attribuzione - Non opere derivate 3.0 Unported License. Based on a work at www.servizisegreti.com.